This is the one! The 65" Signature Series LED outdoor HDTV is sleek, bright and weatherproof. 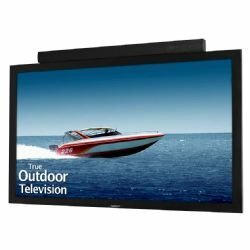 Designed as the ultimate HDTV for outdoor deck, patio, pool, or BBQ areas, the 65" SB-6570HD true, all-weather LED outdoor television makes a grand statement as an outdoor entertainment center-piece. Don't miss a game, event or favorite show while enjoying the outdoors day or night. The SB-6570HD includes a powder-coated aluminum exterior for extra durability against humidity, salt-air, rain, heat and snow ... ability to operate in temperatures above 120 or -20 degrees F., and full-HD 1080p. Pair with our NEW HD wireless transceiver (SB-HDWT) to connect to your cable/satellite box, Blue Ray player or DV-R effortlessly. A table-top stand - the SB-TS657 - is available for this model as a separate item.